Q Why establish brood cover in the autumn? A Broods need to have a rich supply of creepy crawly insects under a canopy such as that provided by flowering cereals. To achieve this, the plants need to be well grown by mid-May when the first pheasant chicks hatch, and autumn sown crops can ensure this. Otherwise, if a spring sowing is delayed by the weather, the plants may be little bigger than rosettes when the chicks hatch. Autumn sowing also gives the chance of a second try in spring in the event of a failure. Q Which crops should I grow? A Complex mixtures are available, but in truth a simple cereal accompanied by the inevitable broad-leaved weeds is all that is needed. Any cereal will do, but a winter triticale (wheat/rye hybrid) is a good choice. It is not prone to the diseases that can affect other cereals and is not particularly palatable to grazers like rabbits. Q How do I grow triticale? A Triticale is an undemanding crop. It can be drilled just like any other cereal, but you can also broadcast it. 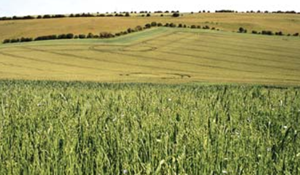 We grow three-metre wide strips alongside good nesting cover like beetle banks, fence lines and hedges. Having rotovated the ground, we scatter the seed from a bucket and use a harrow to bury it, then roll it to ensure good contact with the damp soil. This should all be carried out in October, for quick germination, ensuring the plants are well established before winter. Q Is there any grant aid available? A Depending on how long you keep the crop, this type of brood strip could qualify as either an unharvested or unfertilised cereal headland, as part of the current Stewardship schemes. Since our strips are re-established each autumn, we do not leave them long enough for the higher paying unharvested option. In practice, it may be best to accept that these strips are a small extra conservation measure that is hardly worth ‘claiming’ for. This also gives you the freedom to manage them as you wish if any problems arise, without having to worry about complying with the rules. Learn more about the services our advisory team provide including face-to-face advisory visits.